The Dawnseeker is set in 2245 as the Earth's sun is volatile and threatens to wipe out humanity, but it's not the only thing that's trying. 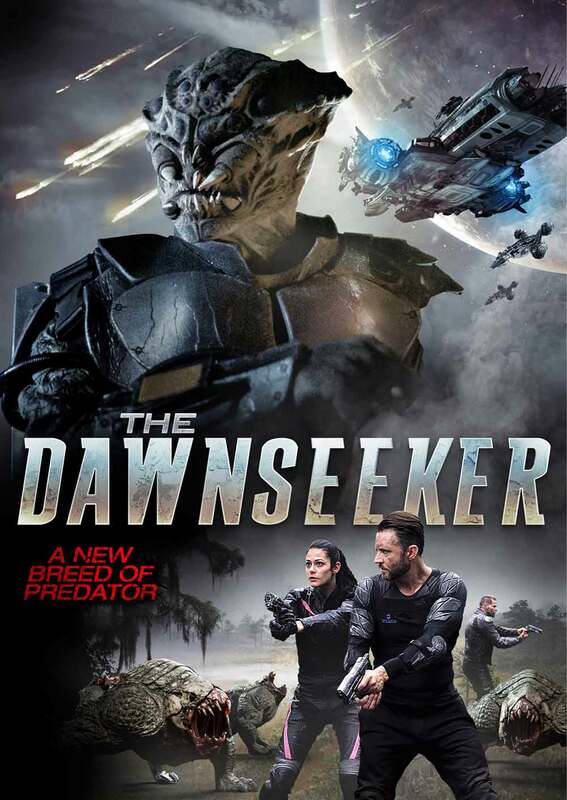 Just in time to beat the new Predator movie to the punch, we get the modest budget Sci-fi Mockbuster The Dawnseeker. In this movie, the year is 2245, Earth’s sun is volatile and threatens to wipe out humanity. Five mercenaries must travel to an uncharted planet in search of a rare mineral called Stardust, which is their only hope to save mankind. The only obstacle is a deadly creature called the Dawnseeker which terrorizes that planet. And the only problem the Dawnseeker has, is that it’s head looks like that of a bat with it’s face smashed in. This description is meant to prepare you for what kind of movie you are in for, that way it will find its audience. If you enjoy fun, indie genre movies that get an “E” for effort, The Dawnseeker is worth seeking out. I feel the best comparison for The Dawnseeker would be the Roger Corman classic, The Terror Within. Give both trailers a watch, you will see what I mean. For example, The Dawnseeker has a scene early on where their general is tasked with giving a long speech full of exposition. He even says “I don’t need to tell you that….” and then proceeds to tell this space force all about it…. at length. The planet featured in The Dawnseeker apparently has atmosphere and gravity that can change depending on the choices made in visual effects or based on how they shot a stunt. The premise is a bit shaky to begin with, the movie never addresses that with the technology they have, Earth could be evacuated Titan AE style. But then we would have no movie, so there you have it. My favorite detail is that a woman named Khu, was not only a Producer and Cinematographer for The Dawnseeker, but she was also a featured actor in the movie! This is very rare and for good reason. The character she plays is Zan, a rogue woman who shows up in the middle of the movie and stays in it for the whole second half. I have read some reviews that have said we need to see more of this character, while that is a good point, she is on screen a lot considering she was the cinematographer. I am sure the rest of the camera crew did most of the job while she was on camera instead of behind it. Another fun fact is that Justin Prince, the writer/director/producer of The Dawnseeker has been about as prolific as filmmaker Joe Swanberg for the last few years. Prince produced four features in 2016, two of which he also wrote and directed. Then he wrote and directed another four movies in 2017. I guess he decided to take a year off by only making The Dawnseeker this year. As long as the quality of the work does not slump from all this output, I am all for it. The acting is okay in this movie, given what they had to work with. Heading the cast is Franziska Schissler (“Ray Gun”, “Blue Hollywood”) as Fenix. She did a great job playing the unspoken leader of this group when the stardust hits the fan. Schissler also carried herself with confidence, which also gave her character some gravitas. Rounding out the cast is Jason Skeen (“Strait & Narrow”, “M15F1T5”) as Otto, the tough talking member of Fenix’s team. Along their travels, they encounter a rival space bandit named York, portrayed by Alexander Kane (“Potter’s Ground (Short)”, “The Truth (Short)”). The visual effects are adequate, as with the production design, it gets the job done. These elements are still a reminder that this is science fiction made on a budget. The total run time of The Dawnseeker is 81 minutes, so if this type of movie appeals to you, I say boldly go there. The Dawnseeker is available on September 4, 2018 on VOD from Uncork’d Entertainment. Curt Wiser is the Writer and Filmmaker of the Suspense movie Cam-Girl, as an artist, he is happy to share a kind word about other movies, even the ones set out of this world.